In a sturdy resealable plastic bag, combine the vinegar with 1/4 cup of the olive oil and the rosemary. Add the steak, seal the bag and refrigerate overnight, turning the bag several times. Preheat the oven to 425° and bring the steak to room temperature. Heat a grill pan. Remove the steak from the marinade and season with the salt and pepper. Grill over moderately high heat until nicely charred on the top and bottom, about 5 minutes per side. 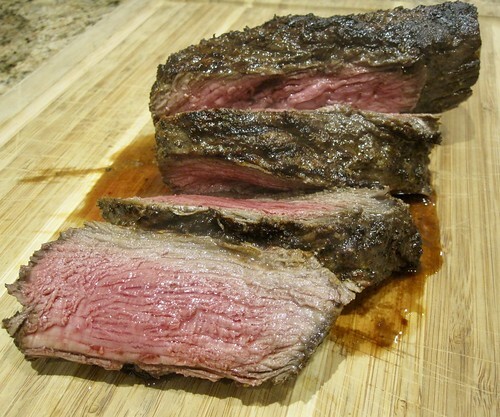 Transfer the steak to a rimmed baking sheet and roast for about 12- `5 minutes for rare or if your grill pan is oven proof just put it in the oven, Or…, build a fire on one side of a charcoal grill or light a gas grill. Grill the steak over moderate heat for 5 minutes on each side. Why would you do anything other than Montreal steak spice, Porto sauce and mushrooms? You know I like trying new recipes and it was really good. Why don’t you start posting all your Smoker recipes. make a new Category.